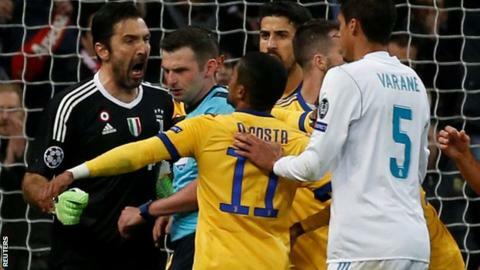 Juventus captain Gianluigi Buffon says he stands by the comments he made about referee Michael Oliver after their dramatic Champions League quarter-final exit to Real Madrid. Buffon was sent off for dissent after Oliver awarded Real an injury-time penalty, and later said the official had "a bag of rubbish for a heart". "The content remains and I stand by all of it," the keeper told Italian TV. "I'd say them all again - maybe with a different type of language." The 40-year-old Italy international added: "You find a way to speak, right or wrong, that at times can seem excessive - but this is me, I am Gigi Buffon." Juventus had come back from losing 3-0 at home to lead 3-0 at the Bernabeu in the second leg of the last-eight tie on Wednesday. Oliver awarded the Spanish side a 93rd-minute penalty for Mehdi Benatia's foul on Lucas Vazquez, which Cristiano Ronaldo scored to send Real through 4-3 on aggregate. Buffon said on Wednesday that it was a "dubious incident" and, speaking on Saturday, he said he had been defending "my team-mates and fans, even in a not very composed fashion". He added that he still believed 33-year-old Oliver lacked experience. "I'm sure Oliver will have a great career in future, but he's too young to officiate a match like that," the goalkeeper added. "A referee with more experience would not have blown his whistle and decided not to become the protagonist of the match. "He would have left it running, turned around and let the two teams fight it out in extra time. Let the pitch do the talking." Police are investigating threatening text messages sent to Oliver's wife, Lucy, after she was abused on fans on social media. Juventus boss Massimiliano Allegri had earlier defended Buffon's reaction, saying for 20 years he had been "a role model on and off the pitch". "If on one occasion he said the things he did, in a situation as tough as Wednesday night's, that is understandable and I challenge anyone to react differently," Allegri said. "It's always easy to judge from the outside. "The referee had a very good game for 90 minutes, he really did. He then slightly lost his way at the end - but these things can happen. "I don't know if it was correct or not, I don't care. But Buffon was also sent off and therefore denied the opportunity to save the Cristiano Ronaldo penalty. Gigi's reaction is to be understood." Real Madrid manager Zinedine Zidane put Buffon's comments down to the keeper being "stressed", adding: "You have to respect his point of view, but I think we deserved to qualify for the semi-finals."